Anything That Can Go Wrong - Universe Galaxies And Stars Section. Anything That Can Go Wrong, Will... on Mars. 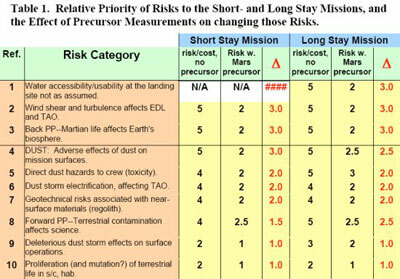 Possible risks for Martian explorers. Image credit: NASA/JPL. When you're exploring new territories, all kinds of things can go wrong. When you're exploring millions of kilometres away from Earth in an environment totally hostile to human life, these risks get deadly. NASA's Mars Exploration Program Analysis Group has put together a list of top risks for human Mars explorers, including the dust and potential biohazards. But one of the biggest risks is the lack of water - it's absolutely essential for a long-duration visit to the Red Planet. The spacecraft door has just clanged shut behind you, locking you and your fellow astronauts into the small cabin that will be your home for the next half-year's journey through interplanetary space - at the end of which you personally will be the first human to set foot on Mars. As the countdown echoes in your ears and as you feel the boosters rumbling beneath you, you wonder... Are we ready? According to Murphy's Law, whatever can go wrong, will go wrong, and presumably this applies on Mars as well as Earth. So if things go wrong on Mars, are we ready for them? What do we need to know about Mars before we send people there? That question is what NASA's Mars Exploration Program Analysis Group (MEPAG for short) addressed in its report dated June 2, 2005, which bears the long mouthful of a title An Analysis of the Precursor Measurements of Mars Needed to Reduce the Risk of the First Human Mission to Mars. The heart of MEPAG's June report is a full-page table on p. 11 that lists 20 risks, "any one of which could take out a mission," says David Beaty, Mars Program Science Manager at the Jet Propulsion Laboratory, and the report's lead author. The group asked itself, "What would we need to learn by sending robotic missions to Mars to reduce each risk? And how much would that information lower the risk [e.g., if engineers could design the spacecraft differently to protect astronauts]?" Loud and clear from the MEPAG report is that "Martian dust is a #1 risk," says Jim Garvin, NASA chief scientist at the Goddard Space Flight Center. "We need to understand the dust in designing power systems, space suits and filtration systems. We need to mitigate it, keep it out, figure out how to live with it." "Most scientists believe it's not possible to evaluate biohazards without a sample return," notes Beaty. In addition, a sample return could resolve controversies about just how gritty or how chemically toxic the Martian soil may be. Even though lunar dust proved to be a major problem for the Apollo astronauts, "lunar dust does not equal Martian dust," Garvin cautions. scientists and engineers simply need to get their hands on real Martian dirt. The significance of a sample even as small as 1 kilogram "should not be underestimated" for both its scientific and engineering value, Beaty adds. The MEPAG report also gave high rank to measurements involving the release of probes with parachutes and balloons into the Martian atmosphere. "We could observe Martian wind speeds at different altitudes, which is vital both for targeting accuracy when a mission lands, and for reaching the right orbit when the mission departs," Beaty says. And then there's water: MEPAG assigns high priority to robotic expeditions that could definitively find water, either as water ice or as deposits of hydrous minerals. Two versions of a first human expedition are being debated: a short stay of about a month, and a long stay of about a year and a half. While a short-stay mission might be able to carry all the water it needed with it - relying on closed-loop life-support systems to recycle waste-water - a long-stay mission would need to excavate fresh water and manufacture breathable oxygen from ice-filled Martian soils. These are but a few of MEPAG's recommendations. The full report may be read here. "NASA is reinventing how it formally acquires advice," explains Garvin. Until the last few years, NASA has relied either on commissioning formal recommendations from the National Academy of Sciences, or on constituting ad hoc working groups. But both "would go quiet" after completing a single report, so there was no mechanism for evaluating how such high-level recommendations translated into concrete specifications for engineering hardware, scientific experiments, and actual measurements. "It's worked so well that we're seeking to use the MEPAG model to form similar groups devoted to analyzing mission approaches to the Moon, Venus, and the outer planets," Garvin says.